The stock market is a dangerous place to be. Watching VIX spiked from 17 to 50+ then crashing back to 30 within two days can certainly cause a cardiac arrest or two. What’s even worse is that investors took this little dip as a buying opportunity throwing more good money at this deformed market. On Tuesday U.S. stocks rebounded to post the biggest rally in 15 months. We have discussed many times that stocks have a long way to go before any normalcy may be restored. On that note, let’s move to the oil/gasoline market instead. Crude oil is not immune to this global equity selloff. 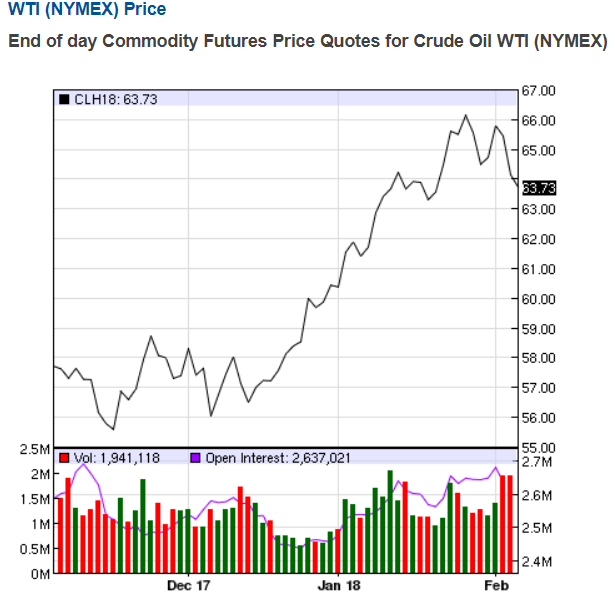 U.S. West Texas Intermediate (WTI) crude ended Tuesday's session at $63.39, which is the lowest in two weeks. Crude oil has actually been on a rally with WTI topping $65/b for the first time in more than three years on Jan. 24 after data showed continuing drawdown of crude storage, while Brent also climbed to around $70, the highest point since Dec. 5, 2014. Market 101, higher prices incentivize more production. 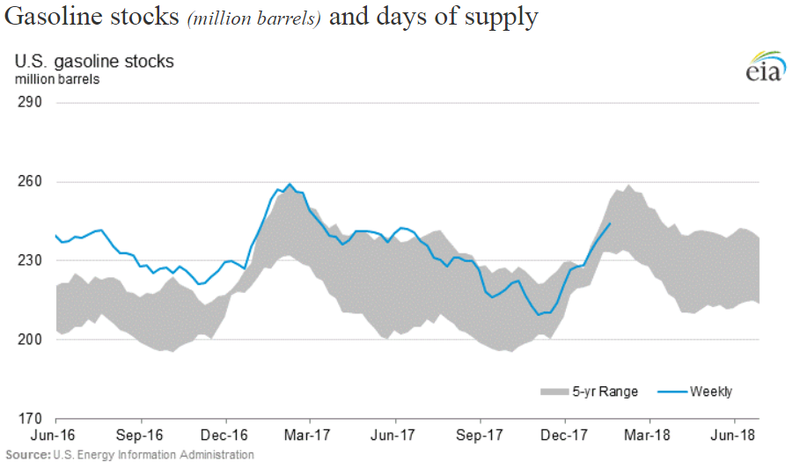 The recent rally in crude prices has led to riving increased investment in Oil & Gas Production facilities and Infrastructure fueling more drilling rigs and oil production particularly in the shale industry. 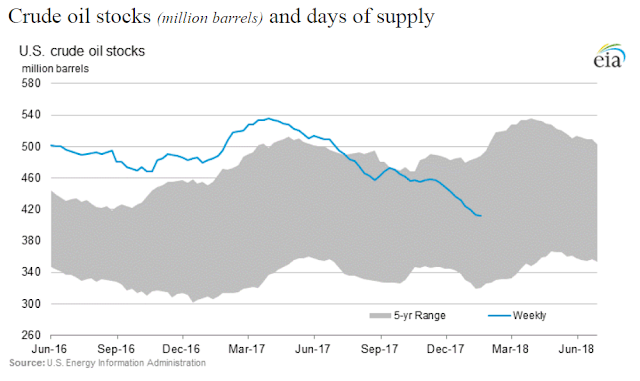 Many small shale oil producers that should have gone bankrupt after the oil crash in 2014 are still hanging in with banks reluctant to write off massive losses still extending life lines. Higher oil price also hurt refining margins. 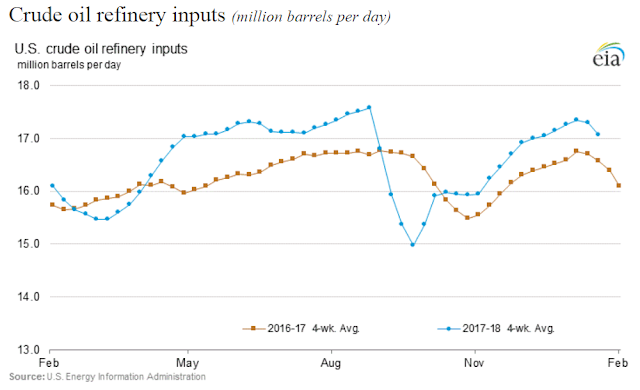 Reuters reported profit margins in key refining hubs dropped sharply in recent weeks - by over 50% in the U.S. Gulf Coast and northwest Europe, Reuters data shows, by as much as over 50% in the U.S. Gulf Coast and northwest Europe. In addition, there’s a bunch of refinery turnaround scheduled in spring increasing expectations that some refiners will reduce operating rates. That would mean less drawdown of crude inventory thus putting downward pressure on crude prices.